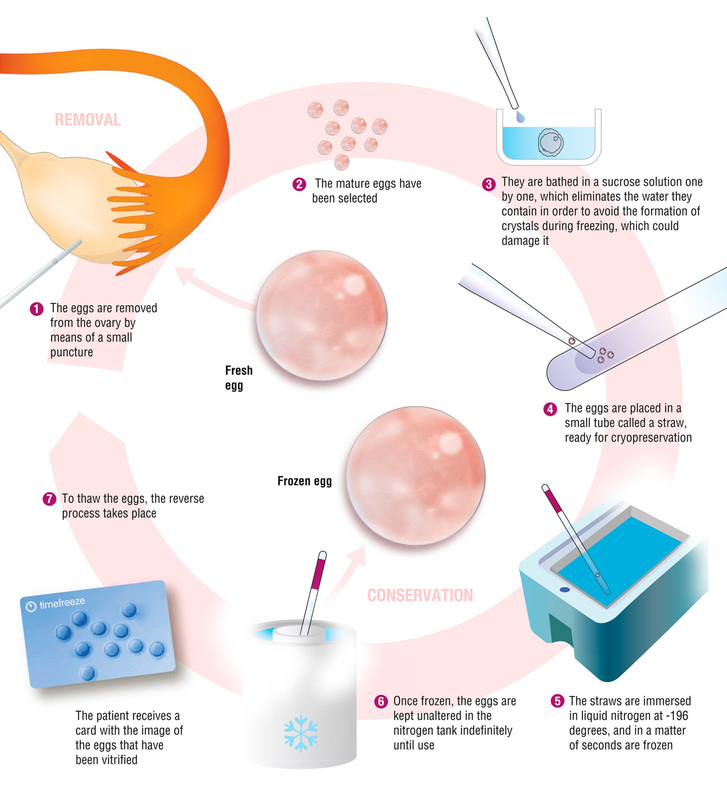 Egg vitrification is the technique which preserves a determinate number of a woman’s mature eggs. We use the ultra-rapid freezing method, which keeps these cells in an unaltered state over an indefinite period of time, until the time they are used. The egg is the woman’s reproductive cell, and it has high water content. At the time of freezing, we prepare it with the utmost care to prevent ice crystals from forming, which could tear the cell wall. Once we have selected a set of mature oocytes, we proceed to deposit each one in its own sucrose bath through a process whereby the cell’s water is absorbed and which we immediately substitute for a specially formulated cryoprotectant. In a matter of seconds, each egg will be at -196 degrees, perfectly stabilised, and with all its components intact. When we need the egg, we thaw it by following the reverse process. By means of this technique, the survival rate of these cells is almost 100%, while they maintain the same characteristics as when they were frozen. At that moment, we will proceed with fertilisation. Our studies systematically demonstrate that the fertilisation rate of vitrified eggs is practically identical to those that have just been removed from the woman’s body. In addition to this, vitrification has added benefits: it keeps the eggs’ characteristics intact indefinitely, and when the time comes, it allows you to programme the transfer at the most convenient time.